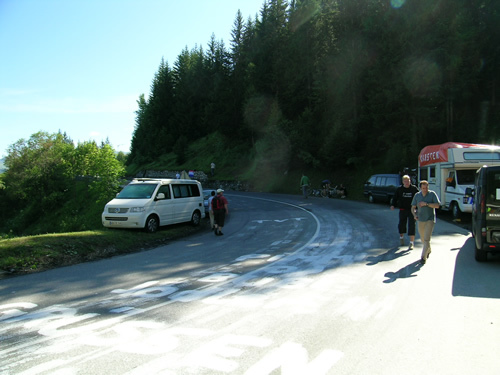 There is a traffic rotary at the base of the climb to Courcehvel. This is where we saw a dramatic increase in traffic of all types: automobile, cyclist and pedestrian. 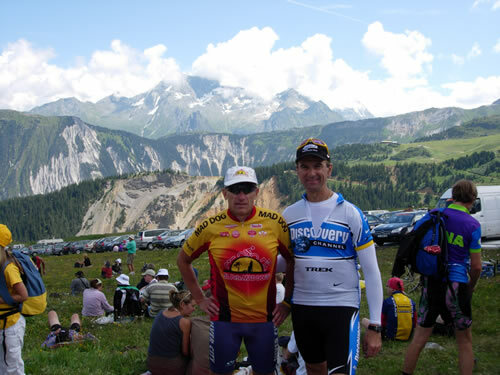 As usual, Tom picked up his tempo riding to the top and Paul and I decided to ride together navigating the crowds. 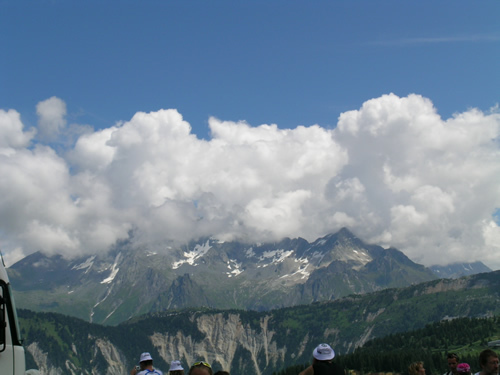 We ended up taking a break at Courchevel 1330 to eat a Gel and take a nature break. 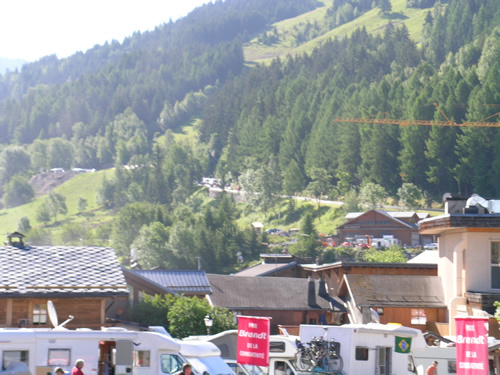 There are several subdivisions to the Courchevel ski area with the main villages known by their elevation .. e.g. 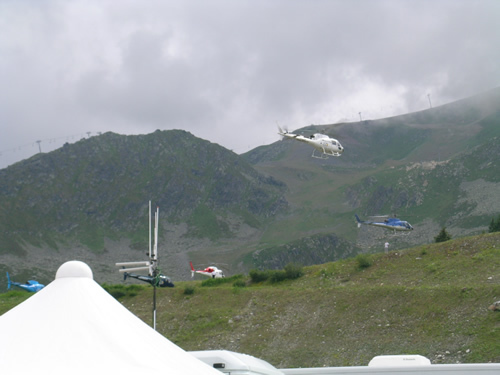 Courchevel 1330, Courchevel 1550 and Courchevel 1850 which is just below the Altiport. 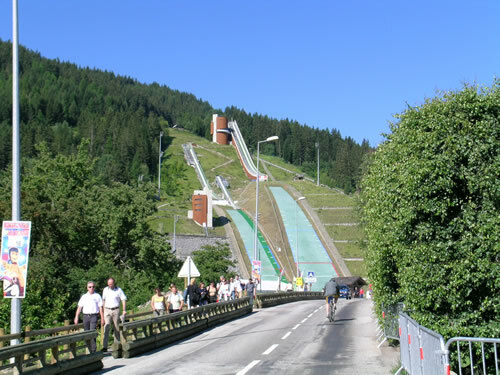 Courchevel hosted some of the skiing and the ski jumping during the Olympics that were held at Albertville. 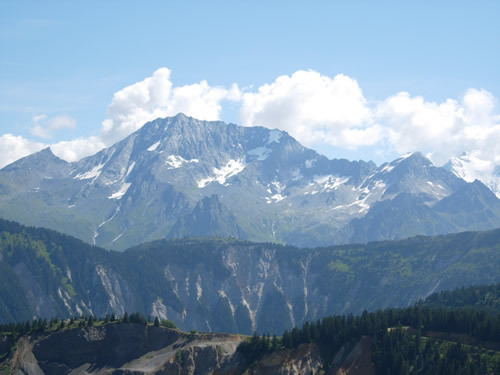 The Ski jumps were located at Courchevel 1330. 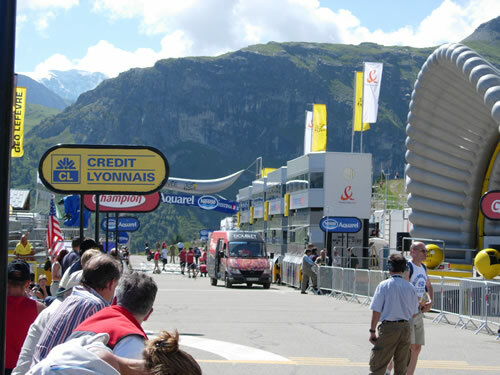 Today we get to see a stage of the Tour de France. Paul has been here before, but Tom and I have not seen a stage live before today. It was strange not listening to Phil and Paul call the races on OLN back home. 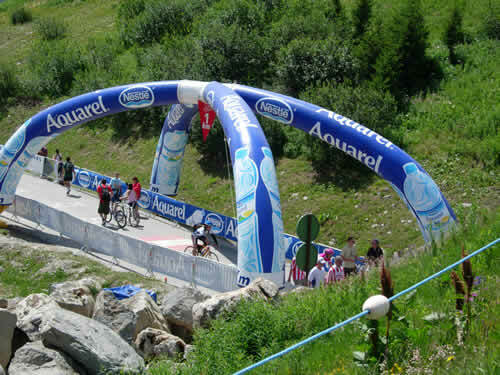 Anyway, the goal today is to get to the top of Courchevel and watch the finish. 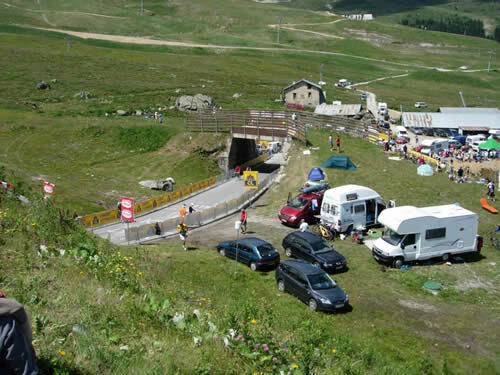 We got up early, drove to Moutier again and found a sweet parking spot right outside the hotel where Vigo, Max and the boys are staying. 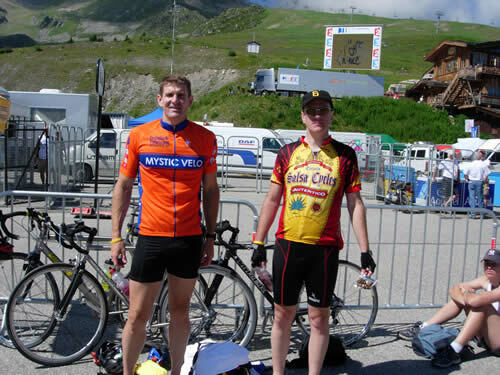 We left the hotel in Moutier about 0830 and made the 6 km ride to the start of the climb to the Courchevel Altiport. On the ride to the start of the climb, I seemed to have picked up a couple of slugs who wanted to climb on my wheel to be pulled to the start. We finally pulled over to have a nutrition bar to force them to go on their own. The running joke of the day was that I was pulling the Chinese national team up the mountain! 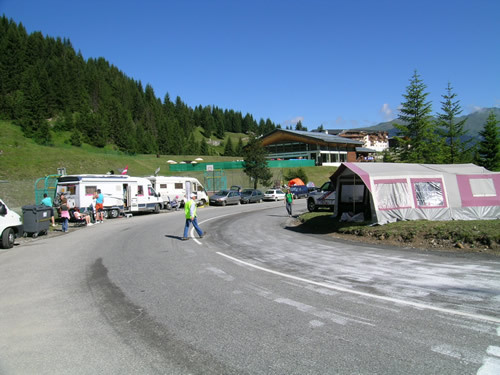 The ride took a bit of a turn upwards heading out of Courchevel 1330 and it was here that we started seeing lots of folks camping out by the side of the road waiting for the tour. 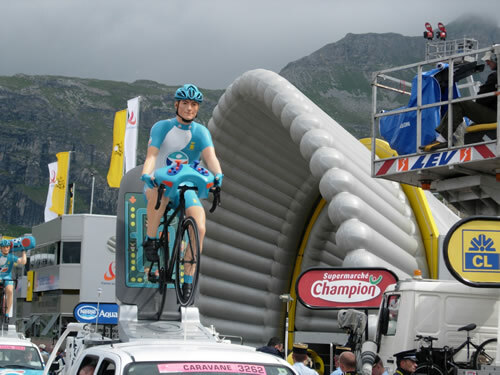 It was very exciting riding though the people and hearing … Allez, Allez as we rode by. We ended up getting lost around Courchevel 1850 as it wasn’t real clear where to go. After turning around and coming back through town, we found our way. 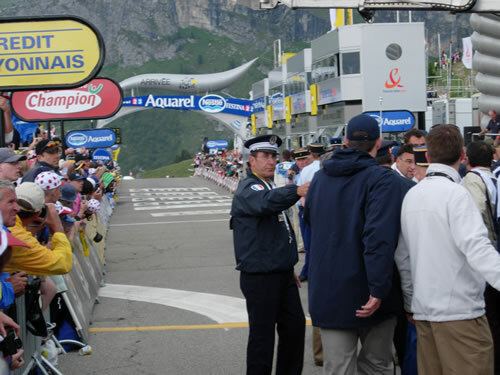 One of the things that happens at a stage of the Tour is that eventually, the Gendarmes will close the rode to first car traffic, then cycle traffic, then completely to everyone. Today, we made it all the way to the 3 K to go before we were told to get off our bikes. It was funny to watch every one get off their bike, walk a few meters and them climb back on and start riding again! It was incredibly cool to continue on riding towards the 1 km kite through all the barriers and in this case through the tunnel that runs below the runway at the altiport. 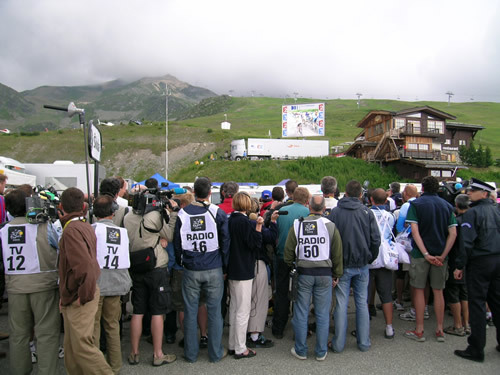 Any tiredness in your legs goes away as you imaging coming up to the finish line in the tour. We made it to spitting distance from the finish line before the road was truly closed … 50 meters to go, so close, yet so far away. Eventually Vigo, Max and some of the other guys from the Custom Getaways group showed up. We had a big spot marked by all our bikes up against the barriers. In the end, that would be good and bad as we’d have to protect them from being crushed as the race was finishing. 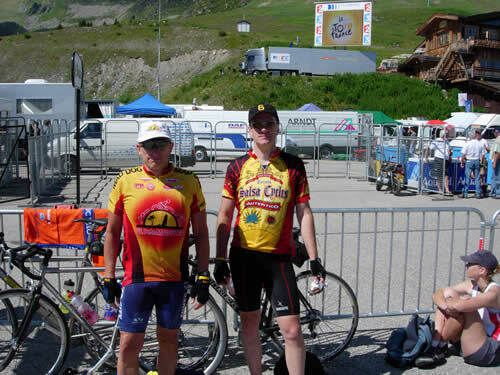 Here, Tom and I wait by the bikes. Little did we know that we’d be right in from of most of the post race activity. The was really a beautiful location for a race finish. The mountains made a tremendous backdrop and there was an airstrip behind us that seemed to be at the edge of the world. 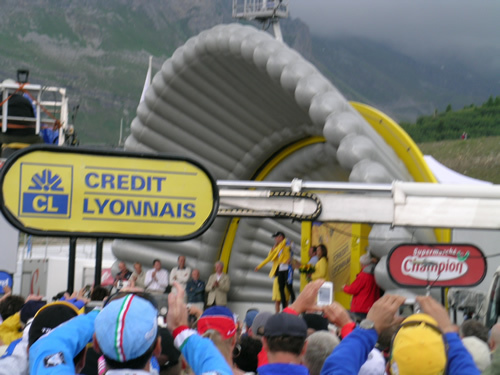 At the Tour de France, they run a publicity caravan about 1 hour before the race arrives. 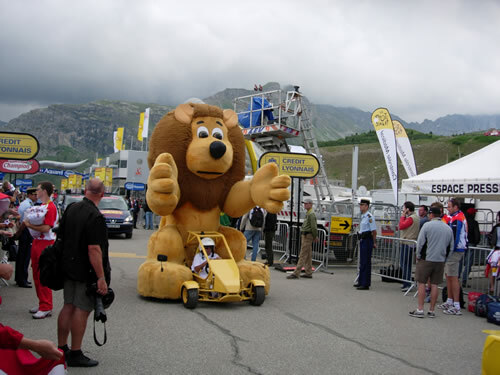 There are the craziest cars and advertisements riding in this caravan and it’s something to imagine how in the world some of these things can make it up and down some of the mountain passes. 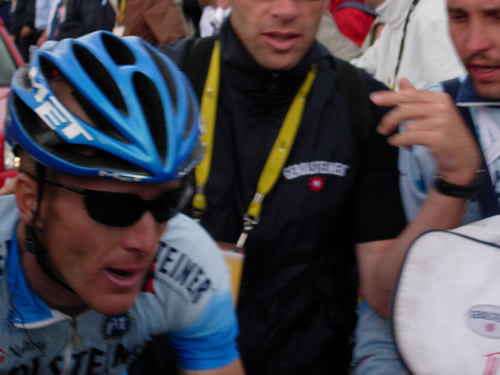 We were having a generally good time watching the crowd, taking pictures of the area, girls in the crowd, ourselves when someone noticed a group of people in Gerolsteiner shirts that said “Leipheimer”. 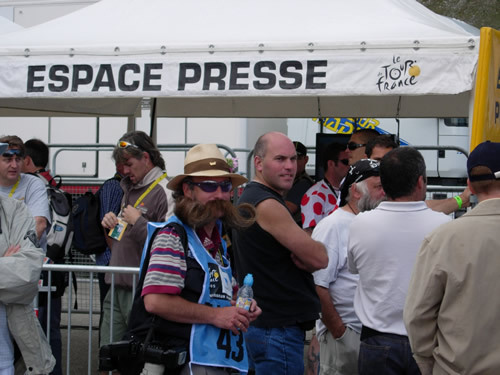 As it turns out this was the majority of Levi Leipheimer’s family. We had a good time talking with his mother, father, brother and sister-in-law. Kind of cool, talking to them and they hung out with us for the whole time until the race finished. 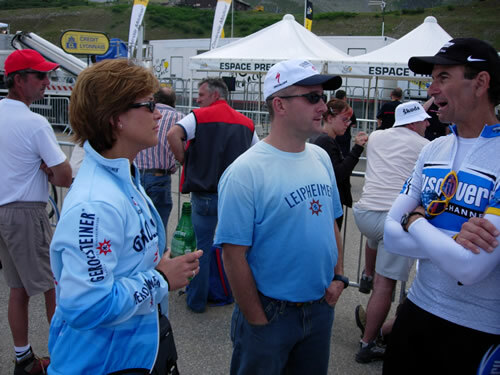 It was neat as the race was finishing to have Levi’s swanier come over to them to tell them that Levi would be running late after the race as his number was pulled (e.g. routine testing). There were lot's of folks walking around. Most were friendly. Here is Al Troutwig, he couldn't take 5 minutes to stop and say hello to a bunch of Americans far from home. We didn't see Phil or Paul .. too bad. We did see Chris Bordman (below left)and this curious character with the wild mustache! 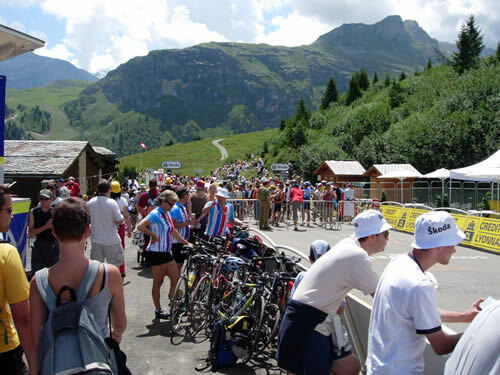 There was so much happening as the race was coming up the mountain. As it turns out, we were right near quite a bit of the press. 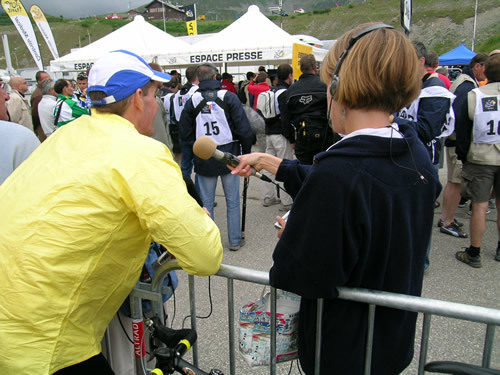 Tom ended up being interviewed by NPR radio and France Channel 3 who is one of the broadcasters of the Tour de France. It was fun, as the race was finishing, they were recording us yelling and screaming in the crowd. Who knows, maybe we were on the radio or TV? 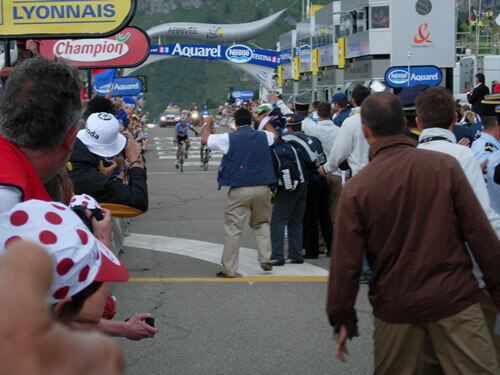 As I mentioned previously, Lance and Valverde came over the line 1 and 2. 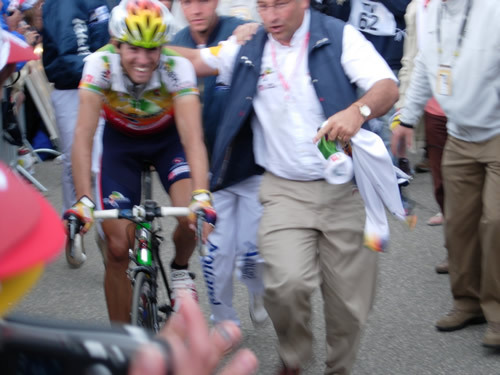 Here is a shot of them just after the line with Lance shaking Valverde's hand. 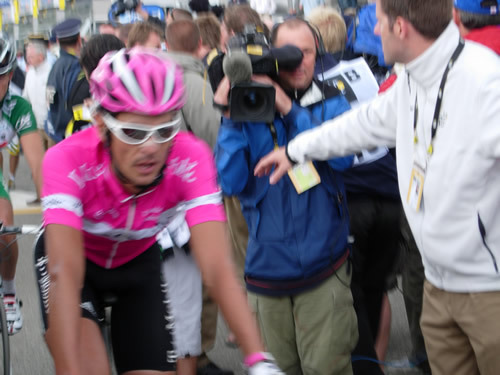 Lance immediate was rushed away through the media circus. Others continued right past us. 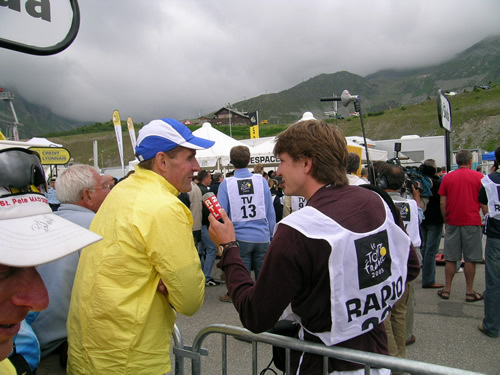 Below are shots of Valverde, Basso, Levi Leipheimer, Kloden, the Kaiser, Jan Ullrich, and finally Vino. 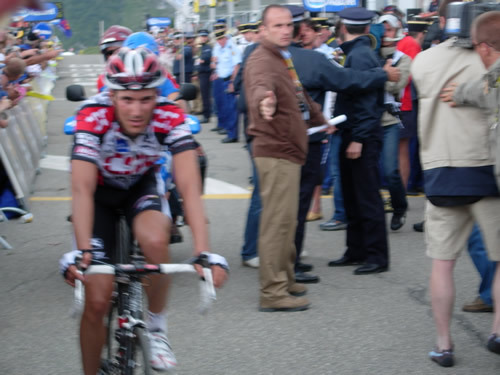 Looking back 4 years later as I update this page, there were quite a few cheats in this race! 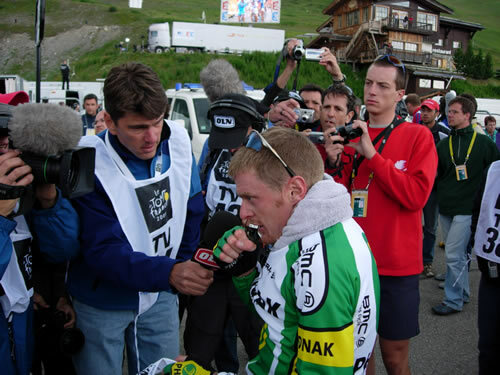 We ended up standing next to Floyd Landis as Frankie Andreau for OLN TV interviewed him. We all commented on how tiny all these guys really are. 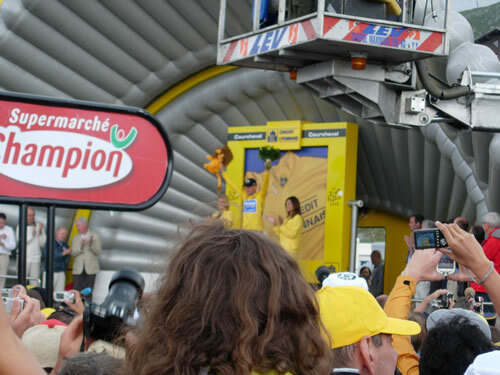 To wrap up the day, we were able to have a pretty good view of the podium ceremony where Lance put on the Yellow Jersey. 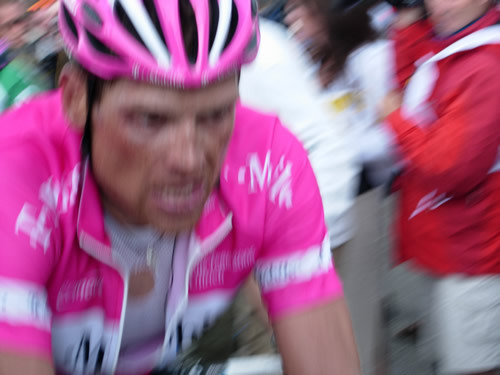 As it turns out, as crazy as it was coming up the mountain, the descent after one of these stages is pure chaos. First, since there was only one road out, we had to wait for the riders and tour officials to ride back down before we could leave the mountain. When we were allowed to leave, it was nuts. Bikes took the left lane and cars took the right lane. 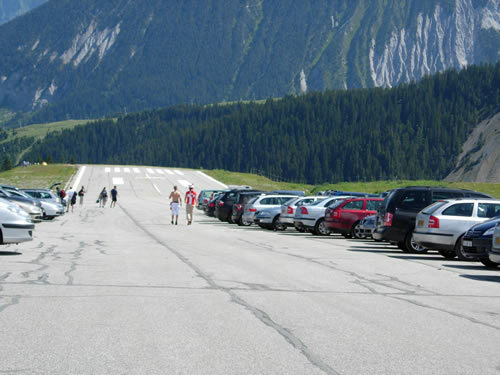 You had to watch out for the cars and the cyclists who anted to fly down the mountain. 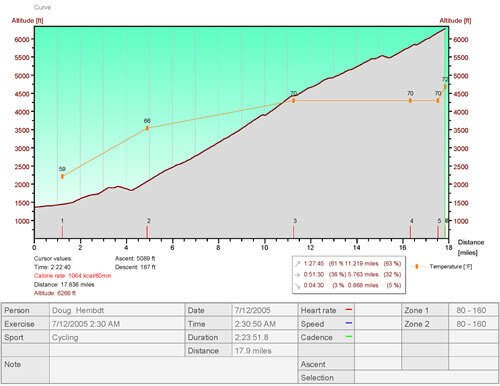 My big day happened at about the 10 km point of the descent. Luckily we were not going very fast, but a BMW pulled from the right lane to the left lane. Everything would have been fine if he had continued on, but he stopped suddenly. I slowed and actually didn’t hit the car with my bike …. 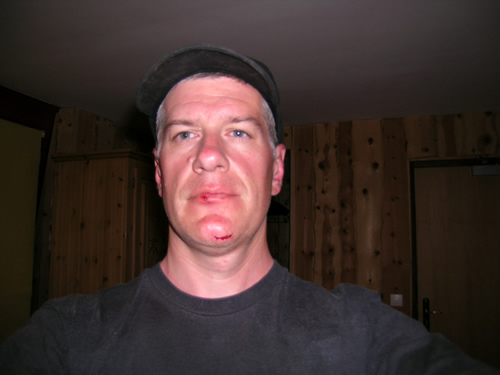 I did go over the handlebars and as a result, I hit the car with my face. Tom says he thought I was dead, but luckily, I had simply broken my tooth, put it through my lip, and slices open my chin. The German guy was pretty upset thinking I was really hurt, but I was fine, just needed to stop the bleeding. A few folks stopped and offered help, but I just needed to sit and rest for a minute before continuing on. 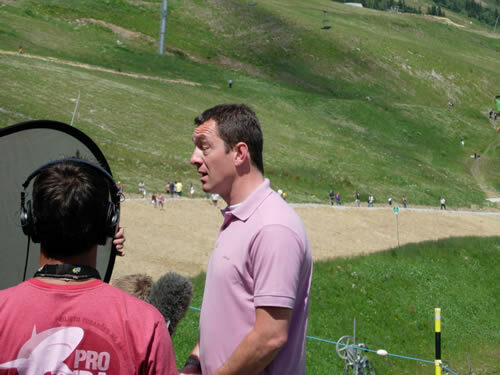 It was interesting riding down a mountain like that with blood everywhere, but I had no interest in testing the French medical system. In the end, I think I caused more damage to the BMW than my new tooth would cost me! We had a two-hour drive to our hotel in Villar D’Arene after the race. Luckily I was able to stop the bleeding, but the wound oozed the whole way. The hotel in Villar D’Arene was really nice and more than made up for the last hotel. 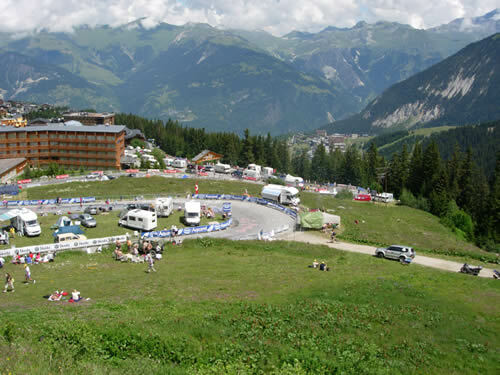 It’s also on the slopes of the Col du Lataret. 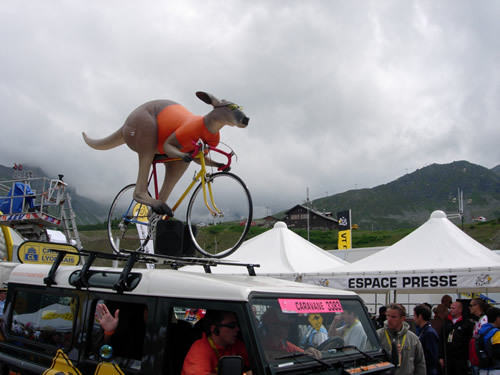 Tomorrow is L’Alpe D’Huez. When we got off the road, the crowds were starting to grow, but we were able to walk around the finish area and eventually found Tom. He had staked out a pretty good spot about 50 meters past the finish line right up against the barriers. 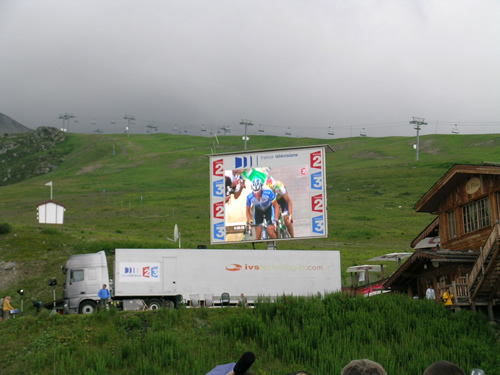 It was a good spot, we could see the finish and also had a clear shot to watch the “Jumbotron” in order to watch the race. We spread out and staked out our spot.